This ninth edition of Who's Who in International Affairs provides, in one volume, biographical information on more than 6,000 people prominent in the fields of international politics, diplomacy, law and economic affairs throughout the world. As well as politicians and diplomats, the book also includes academics, think tank analysts, and journalists, among others, who are active in, or relevant to, the world of foreign affairs. Who's Who in International Affairs is thus an invaluable guide to the lives and careers of the most important figures in international affairs today. Each entry is clearly laid out, with the international figure’s personal details, education, career, publications and contact information conveniently divided into sections. In addition to the biographical information, an extensive index section is included, where entrants are listed once by nationality and for many by selected organizations for which they work. Also provided is the Directory of Diplomatic Missions appendix that lists by country all embassies and diplomatic missions to other countries around the world, including missions to the United Nations. Listings include contact information and names of ambassador or head of mission. Abbreviations. International Telephone Codes. Obituary. 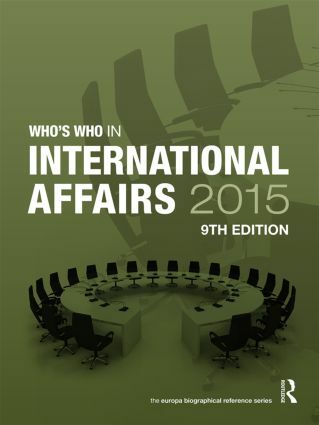 Who's Who in International Affairs 2015. Appendix: Directory of Diplomatic Missions. Index by Organization. Index by Nationality.